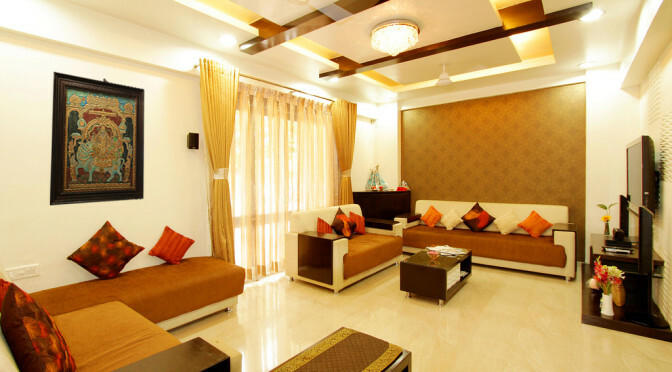 We all like to have very beautiful and elegant interior decor in our home; especially in the living area. 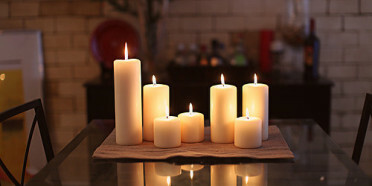 We also want to make sure that the decor looks clean, tidy and beautiful all the time. When you have kids around, and their stuff lying everywhere in the house, it becomes a seemingly impossible task. And suddenly a guest may pop in, unannounced, getting us into an embarrassing situation. We do not like the guests to see toys, newspapers, magazines just lying around, on the floor, especially in the living room. All of us must have come across this situation many a times. Now there is an end to this embracing situation as a host of the house. The Heritance Team has come out with a solution for this problem. This rectangular Wood Trunk Box has a luxurious space to store your wares and fits nicely into smaller rooms. 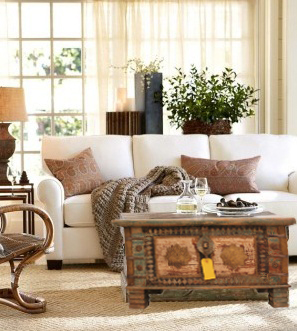 • This Rustic Table Storage Trunk Chest brightens your room and gives your décor a very relaxed look. You can also place a vase, or an artifact on it. This box itself can be an artifact. • Regardless of the personal tastes of an individual, you can find a perfect COFFEE TABLE in this wooden trunk box. • Living Room is the room where all guests gather. Expand your storage and make it more attractive and elegant with a box like this. 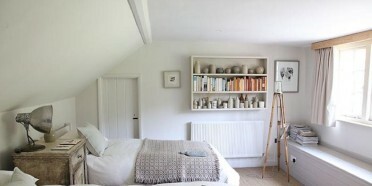 You can use it to keep the necessary living rooms items like old newspapers, Magazines/Books, etc in an ORGANISED way. • On the arrival of the surprised guests, you can also use it as a last minute STORAGE PLACE to dump the toys, news papers, magazines, etc. 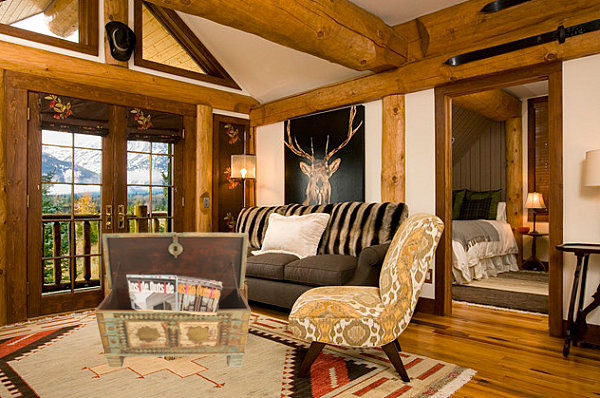 • Most important, this multi-purpose Rustic look trunk box can go with MODERN / CONTEMPORARY interior style. 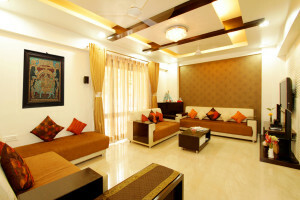 Look at this very common living area which is generally found in all Indian houses. 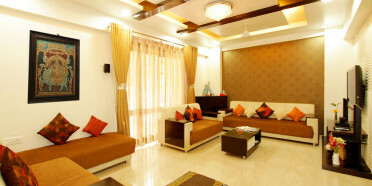 The large hall area is divided into a sitting area and a family room. The interior is contemporary in style with a traditional fusion. The furniture is contemporary in design and made of wood. The colours of the wooden planks on the ceiling, the traditional 2-layer curtains and the textured wall are in harmony, and adds a very traditional touch to the room decor. For the white, one can have many options of choosing from various paintings and wall hangings. By placing a single ‘Tanjore painting’ on the white wall, the beauty of the room is enhanced. Though this Tanjore painting is traditional, yet it easily merges with the contemporary interior style. The room is filled with the royalty and richness of Indian heritage. In this painting, Shiva–Parvati seated on Nandi are beautifully depicted. Tanjore painting, a truly Indian Heritage !! It originates in Tanjavoor in South India and has a unique style. These paintings are known for their surface richness, vivid colours, compact composition and breathtaking beauty. It comes in three finishes- normal, antique and embossed. The paintings are decorated by a gilded and gem-set technique, a technique where 22 ct gold leaves & sparkling Tanjore stones are used to highlight certain aspects of the painting like ornaments, dresses, etc. This South Indian style painting is very much alive with its details & colouring. The right use of gold foils, striking colours and a very powerful story makes this artistic marvel a must have. 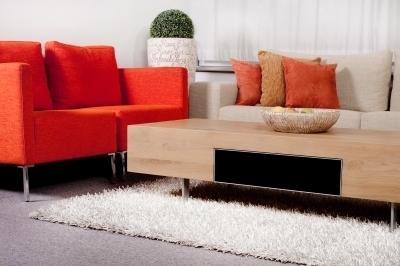 A centre table in the centre of the main seating area in the living room is a common feature. However, some, especially those living in small apartments resist it; usually because they feel it makes the space look and feel constrained and smaller. While that is understandable, even in those cases, one could still consider a small table, maybe made of glass, for it has several advantages. 1. Conversation starter: A centre table binds people sitting around it over a tea or beer. You could place your drinks and snacks on the table and go on chatting for hours, getting up only for refills. 2. Mini library: A centre table can house magazines and newspapers at the bottom level. This encourages the reading habit. 3. Decorate: The table can be used for some decor. You could put up an unbreakable centrepiece like a figurine that you picked up in your last trip. Of course, the centre table is the most comfortable place to put up your legs when you are tired.